Google Reader Shared Items 2011-04-06 | Okay, Whatever. I just brazenly take as many as I want. Which is often zero. When we go to Costco we always bring multiple disguises so that we can visit a sample stand more than once. Ambrose Heron compiled a list of music cues used repeatedly in different movie trailers: near the top is one I always seem to notice, a segment from James Horner’s Aliens soundtrack. Precision was always going to be restricted by the nature of the 48 hour challenge, very short time to conceive, write, shoot, edit and score! Not to mention the restriction of a prop, title and dialogue that had to be included in whatever we created. We did not let that stop us though and thought ambitious thoughts. 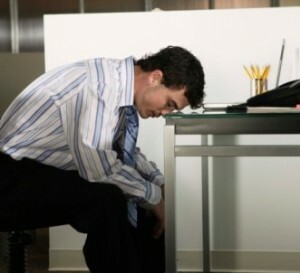 Dialogue: It is just a glitch in the time continuum, it will sort itself out in a minute. Just hope it won’t wipe you out in the mean time. UC Berkeley postdoc Aaron M Hoover combined math and imagination to solve the problem of building a one-sided “Möbius gear.” He rendered it and then output molds for it on a 3D printer, cast them, and assembled his freaky, mind-melting beast. 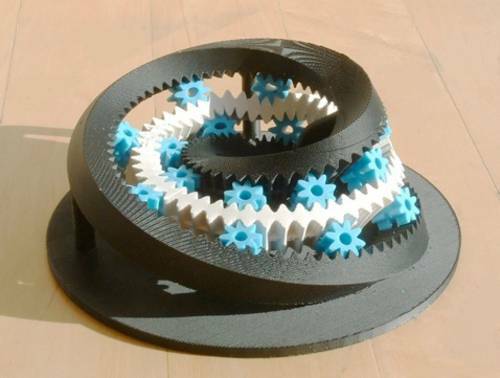 While searching for a suitable project for CS 285 (Procedural Solid Modeling) I was introduced to the Möbius gear by Professor Sequin. I was immediately intrigued by the curious combination of the Möbius mathematical surface popularized by M.C. Escher and functional mechanical gear elements. After some time staring at and puzzling over this image, I convinced myself that this mechanism is indeed possible and that with right tools, a functional prototype could be built. (The entire mechanism essentially boils down to an oddly configured set of planetary gears. One can think of the black portion in the image as the ring with a fixed zero input velocity. A single blue gear is a planet, and the white strip is the sun. Output can be taken either from the sun or the planets (with no regard for practicality!). In practice, however, it’s easiest to actuate the Möbius strip (the white portion). 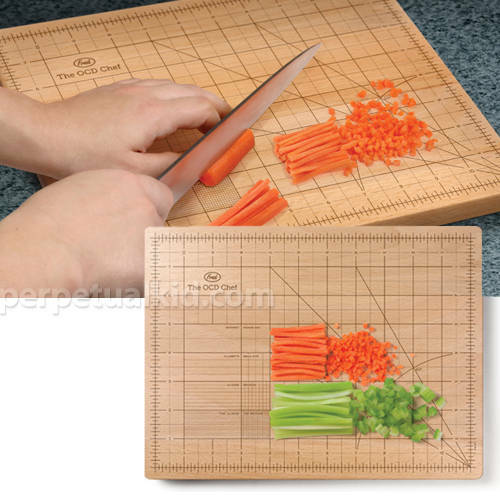 The OCD Chef Cutting Board is screened with fine, precise measurements so that you can cut all your food into perfectly even, perfectly angled chunklets. < logic> I forgot whether I was running screen or not. < logic> And I just started up another one, y'know – just in case. < logic> And a little voice in my head said "A screen with in a screen. You live up to your reputation, Mr Carroll." < logic> Did I just get trolled by Chris Nolan?